Stamped concrete is ideal for floors and pavements in high-profile commercial environments, which are much more demanding than residential settings. Like all concrete pavements, they withstand heavy foot and vehicle traffic, resist abrasion and stains, and are easy to maintain. They can also be given slip-resistant textures and finishes to avoid injuries to customers and pedestrians. Visually, stamped concrete blends in beautifully with other building materials and architectural styles and is readily adaptable to different design schemes, ranging from Old World to ultra-modern. Mark Balogh of ArCon Flooring in Las Vegas works with many different types of materials on his commercial projects, but he finds stamped concrete to be the most versatile. "I have seen a situation where expensive imported tile and stone were purchased and discarded mid-project because installation was painstaking and time-consuming. Tile and stone may be beautiful, but concrete is beautiful, versatile and readily available locally, which is an environmental and cost consideration. It also provides excellent long-term durability.” See these examples showcasing various ways to use stamped concrete for commercial applications. Use colors and stamp patterns that reflect the image of a restaurant or business. This porte cochere (a large covered drive-through area) at the luxurious Wynn in Las Vegas was designed to be reminiscent of the grand resorts and villas of Switzerland and Tuscany. 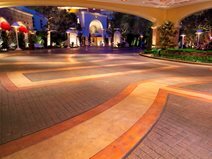 Mix bands of stamped concrete with integrally colored concrete to create patterns that improve traffic flow and direct the eye to various focal points. 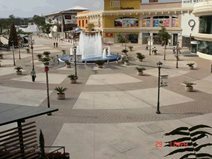 At La Gran Via shopping mall in El Salvador, bands of stamped concrete radiate from a circular fountain like spokes from a bicycle. Use color schemes and textures that mirror the character of the surrounding landscape. 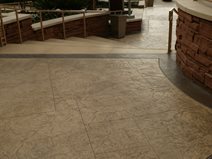 For the entries and walkways throughout the Red Rock Casino Resort and Spa in Summerlin, Nev., stamped concrete in a worn river rock pattern was colored to echo the natural colors of the surrounding desert and mountainscape. Multiple colors and stamp patterns can be combined to create show-stopping pavements. At the upscale Srour Apartment Complex in Rockville, Md., over 12,000 square feet of stamped concrete was installed using two different colors and stamp patterns to create a spoke pattern. The patterns used were London cobblestone and a brick soldier course, while the colors were palomino and moonlight gray. 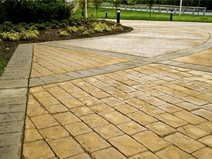 Use stamped concrete for the parking lots of commercial office buildings to beautify the grounds and help demark parking areas. 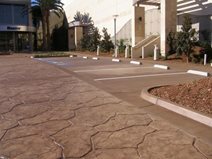 This commercial parking area at Hunter Industries, San Marcos, Calif., was stamped with a small and large sandstone pattern with dusted-on color.